"The Village with a View"
Location of Wauconda in Lake County, Illinois. 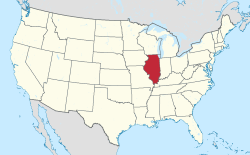 Wauconda (/ˌwɔːˈkɒndə/ or /wəˈkɒndə/) is a village in Lake County, Illinois, United States. The population was 13,603 at the 2010 census. It is the site of the Wauconda Bog Nature Preserve, a National Natural Landmark. Wauconda Community Unit School District 118 serves students from kindergarten through 12th grade who live in Wauconda and surrounding communities (Island Lake, Lakemoor, Volo, and unincorporated sections of McHenry County). Fremont School District 79 also serves students from communities from northern part of Wauconda. Wauconda's local government consists of a Mayor, Clerk, and six-member Board of Trustees who are elected to four-year overlapping terms of office. Village Board meetings are held on the first and third Tuesday of the month. Committee of the Whole meetings are held the second, fourth and sometimes fifth Tuesday of the month. The Village Administrator oversees all village departments and serves as a liaison between the village residents and the Board. The Administrator supervises the daily operations of the village with the assistance of staff, including the Chief of Police and the directors of Public Works, Finance, Human Resources/Risk Management, Information Technology, Environmental Quality, Building and Zoning, and Economic Development. There is a library on Main Street, called Wauconda Area Library, which serves the village. According to local legend, Wauconda was supposedly named after an indigenous chief whose name translated to "spirit water". Many indigenous people had already migrated westwards when the first settlers arrived. Many early settlers of Wauconda came from New England and New York by covered wagon or through the Erie Canal and the Great Lakes. Elihu Hubbard built the first log cabin on the bank of Bangs Lake in 1836. Justus Bangs, the first settler in Wauconda, built a house next to the lake in 1848 and the lake was later named after him. In 1840, members of the Winnebago tribe who did not leave the shores of the Fox River often went to the area to trade. In 1849, Wauconda was formally organized and the first town meeting was held in April 1850 on the first Tuesday. Wauconda's first school was built in 1839 and the area's post office was moved to Wauconda on June 27, 1849, with Hazard Green becoming its first postmaster. Elder Joel Wheeler of McHenry built the first Baptist church in Wauconda in the autumn of 1838. A Methodist church was organized on September 3, 1852 by Reverend C. French, and built in 1856 on the Commons. Both Methodists and Baptists attended prayer at the church until February 1870, when the Baptists reorganized and built a new church on October 30, 1870. A Roman Catholic church was built in 1877 and its first trustees were James Murray, Charles Davlin, Felix Givens, Hugh Davlin, and Owen McMahon. Its first priest was Father O'Neil. In 1850, Wauconda had a population of around 200 residents, and the town had three goods stores, two public houses and various mechanics. Wauconda is located at 42°16′1″N 88°8′34″W﻿ / ﻿42.26694°N 88.14278°W﻿ / 42.26694; -88.14278 (42.266910, -88.142657). According to the 2010 census, Wauconda has a total area of 5.732 square miles (14.85 km2), of which 5.05 square miles (13.08 km2) (or 88.1%) is land and 0.682 square miles (1.77 km2) (or 11.9%) is water. A small private airport, Air Estates Airport, is located northeast of Mundelein. As of the census of 2000, there were 9,448 people, 3,611 households, and 2,404 families residing in the village. The population density was 2,445.0 people per square mile (945.1/km²). There were 3,822 housing units at an average density of 989.1 per square mile (382.3/km²). The racial makeup of the village was 90.2% White, 0.4% African American, 0.3% Native American, 1.8% Asian, 0.0% Pacific Islander, 6.4% from other races, and 0.9% from two or more races. 11.9% of the population reported being Latino of any race. There were 3,611 households out of which 100% had children under the age of 18 living with them, 54.2% were married couples living together, 8.3% had a female householder with no husband present, and 33.4% were non-families. 27.4% of all households were made up of individuals and 9.4% had someone living alone who was 65 years of age or older. The average household size was 2.58 and the average family size was 3.16. In the village, the population was spread out with 25.1% under the age of 18, 7.2% from 18 to 24, 35.8% from 25 to 44, 20.5% from 45 to 64, and 11.4% who were 65 years of age or older. The median age was 36 years. For every 100 females, there were 101.9 males. For every 100 females age 18 and over, there were 98.1 males. The median income for a household in the village was $65,805, and the median income for a family was $56,576. Males had a median income of $64,027 versus $43,125 for females. The per capita income for the village was $40,355. About 2.1% of families and 4.0% of the population were below the poverty line, including 2.1% of those under age 18 and 4.0% of those age 65 or over. Every summer, the Wauconda Chamber of Commerce holds a two-day rodeo to raise funds for their other works. It is the only IPRA-sanctioned rodeo in Lake County. Also, Wauconda Fest, hosted by the Wauconda Park District occurs over the last weekend of June each year, and has been voted best community festival in the Daily Herald Reader's Poll the last several years. And, the Park District also hosts the Wauconda Triathlon in July of each year. In January for the last ten years, the Lake View Villa Association has hosted an ice-fishing derby to raise funds for various veterans' programs, including Wounded Warriors and TLS Veterans Outdoors. In 2018, over 500 entrants participated in the derby, and LVVA presented a check for $40,000 to Wounded Warriors. On January 28, 2005, over 3,000 people participated in a snowball fight for ten minutes, setting a new world record for most participants in such an event. The Blues Brothers was partially filmed in the village. A segment of the chase scene during the final third of the film featured the US-12 highway overpass over IL-176 (Liberty St.), as was a scene with the Blues Brothers driving onto Phil's Beach on North Main Street. In 2018, the village began to receive prank phone calls with the release of the film Black Panther. This was because, in the movie, the homophonous fictional country Wakanda is where the narrative is mostly set. ^ "Geographic Identifiers: 2010 Demographic Profile Data (G001): Wauconda village, Illinois". U.S. Census Bureau, American Factfinder. Retrieved December 18, 2012. ^ a b c d e "History of Wauconda | Wauconda, IL". wauconda-il.gov. Retrieved 9 May 2018. ^ Moran, Dan (February 23, 2018). "Wauconda, not to be confused with Wakanda, has an accidental association with 'Black Panther'". Chicago Tribune. Retrieved March 18, 2018. This page was last edited on 7 April 2019, at 01:17 (UTC).